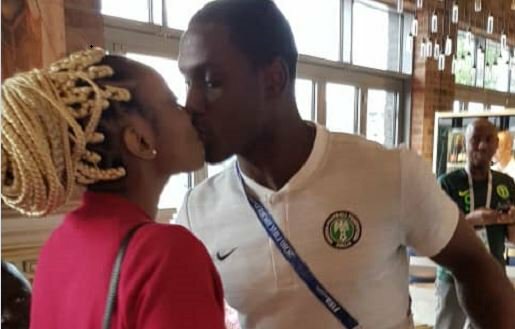 Super Eagle’s Odion Ighalo got a birthday kiss from his wife, Sonia Ighalo who came in to wish her husband a happy birthday as he gets ready for Nigeria’s World Cup game against Croatia. To celebrate his 29th birthday, Sonia visited Ighalo at the Mercury Hotel, Kaliningrad, Russia and gifted him a bouquet of flowers. Ighalo earlier revealed to TheCable that beating Croatia on will be his best birthday gift. Nigeria, in Group D, will also play against Argentina and Iceland.